An edited version of an article, ‘Becoming a better sculptor’, published in the Visual Artists’ News Sheet (Jan-Feb 2014 issue) – view or download a PDF of original here. 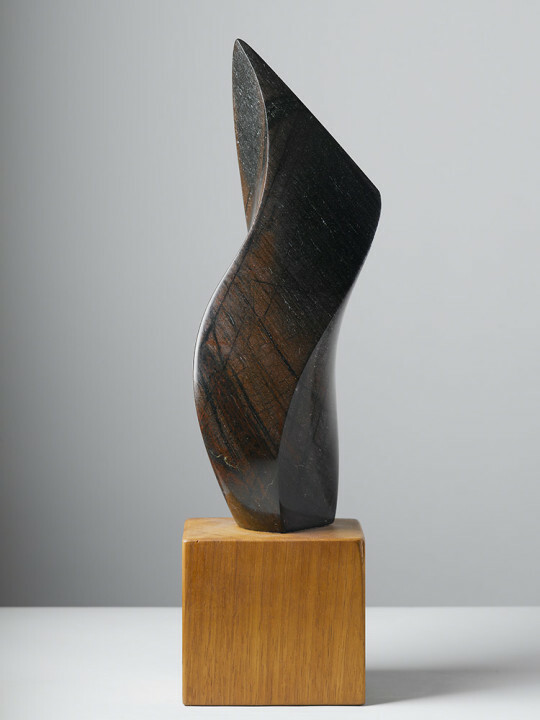 I first encountered sculpture at the Barbara Hepworth Museum at St. Ives as an ‘A’-Level art student. The three-dimensional world made much more sense and I was glad to abandon ‘flat art’ in pursuit of this vital goal; painting was all illusion – sculpture was real. I went on to study it at the University of Chichester where my lecturer was an exponent of Modernism and the 20th century British School. A college trip to Paris delivered me to the studio of Brancusi where I was struck down, but this blow was to prove double-edged; when you admire the work of a genius, how can you emulate that work without falling into pastiche? I came to Ireland in 1994 and set up in business as a sculpture conservator. This was another part of my education; witnessing the skill of medieval stone carvers in churches and cathedrals across the country was a revelation. Overall, the time spent in conservation was like an extended apprenticeship; art history, carving techniques, maintenance, geology, chemistry – all these gave me the chance to learn how sculpture is made. After twenty years of cleaning and repairing other people’s artworks, I was finally compelled to start carving my own work full-time. Part of the process has been seeking justification within the context of making art today; how can such an ancient practise as stone carving be relevant? I held to several Modernist principles for many years, a la Greenberg, but ultimately found his viewpoint to be constraining. The tearing up of Greenberg’s rulebook and the cycle of all the other -isms, each debunking the last in turn, has left a playing field with no borders – contemporary sculpture can be, as Rosalind Krauss put it, “almost infinitely malleable”. However, I find that the philosophical arguments behind some of today’s art are often diluted forms of Marcel Duchamp’s ideas of a century ago and there is actually nothing new in them. So how to function in the art world today, the era of the ‘post-object-based’ art practise, where ambiguity and confusion are celebrated and where facile and derivative arguments that are ill-conceived and badly rendered reign supreme? I have had to learn to trust my instincts. My appreciation of art is not intellectually driven, it’s a visceral reaction that has, on a few occasions, brought me to tears in the presence of a truly great sculpture. I don’t want the work explained, I just want to look at it and be moved by it. Equally, my own work does not need to be over-analysed; it exists purely because I’m compelled to make it. I have no world-altering message to convey, it’s more about a commitment to form, to the medium and to its historical thread – the Egyptians, Praxiteles, Michelangelo, the School of the West, Hans Arp, Peter Randall-Page, etc.. The audience isn’t offered a backstory, or my pound of flesh, as seems to be a current requirement, and I don’t use wall text panels filled with ‘artspeak’. I believe that an artwork should be judged on its own aesthetic merits and any pseudo-intellectual justification for it only distracts the mind from the question the eye is asking; Is it any good? Thankfully there are many strata to the art world, and there is enough room for object-based sculptors like me at one end of the spectrum and conceptual artists at the other; it’s Mozart for some, Motörhead for others. The compulsion I have to carve results in fulfilment, even when it’s a challenge or a struggle, and this, I believe, is a good reason to pursue anything. My primary aim is to become a better sculptor and to make work that resonates. It will take a lifetime.